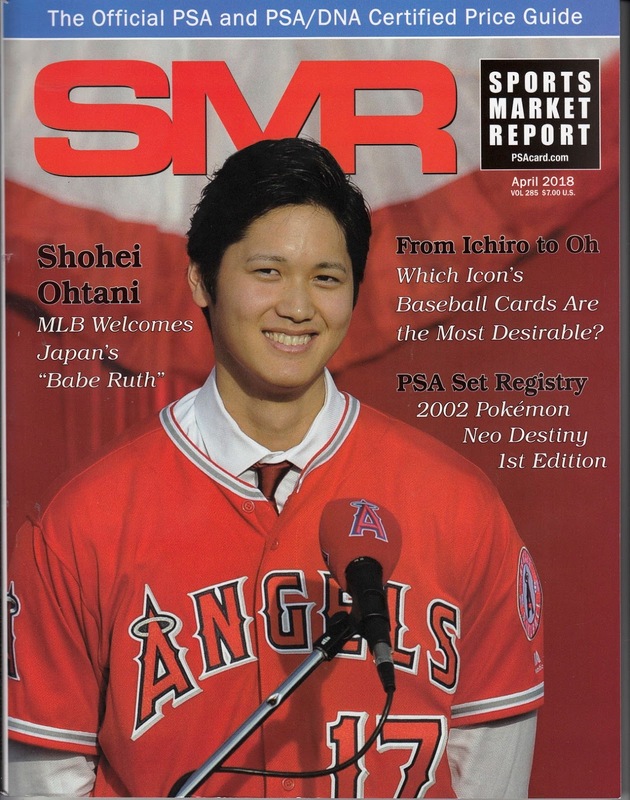 I was interviewed a few months back by Sports Market Report (SMR) magazine writer Kevin Glew. The issue with his articles came out this week. There really wasn't a lot of his interview with me in the articles - he had a lot more from Gary Engel, Robert Klevens and Rob Fitts (which makes perfect sense) and also from collector David Saba (which also make sense since David is a collector of PSA graded cards - PSA being the publisher of SMR - and I'm not). Sean was also quoted in an article about Calbee. 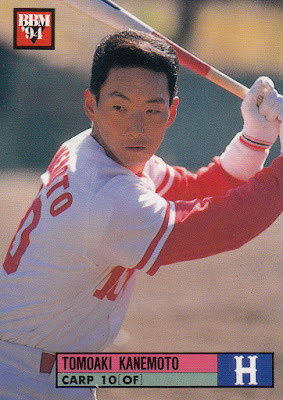 Mostly my contributions are in regards to Shohei Ohtani's cards. The articles by Glew are very comprehensive and quite interesting. There's also an article by another writer regarding the 1967 Kabaya-Leaf set which is incredibly detailed. Portions of the magazine will eventually be on-line I think but currently it's only available at the news stand. The cover price is $7.00. I assume you can buy it in hobby shops but since I don't usually go to them (I'm unlikely to find any Japanese cards at my local stores) I don't know that for sure. 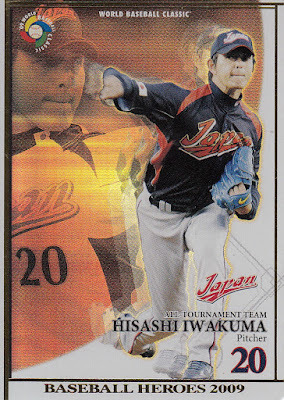 Night Owl Cards started a Blog Bat Around a couple weeks ago that asked bloggers to write about their various card collecting projects. I'm a bit late on this but I thought I jump in on it. Back in 2000 Upper Deck released a 264 card set dedicated to the Japanese team for that summer's Olympics in Sydney. 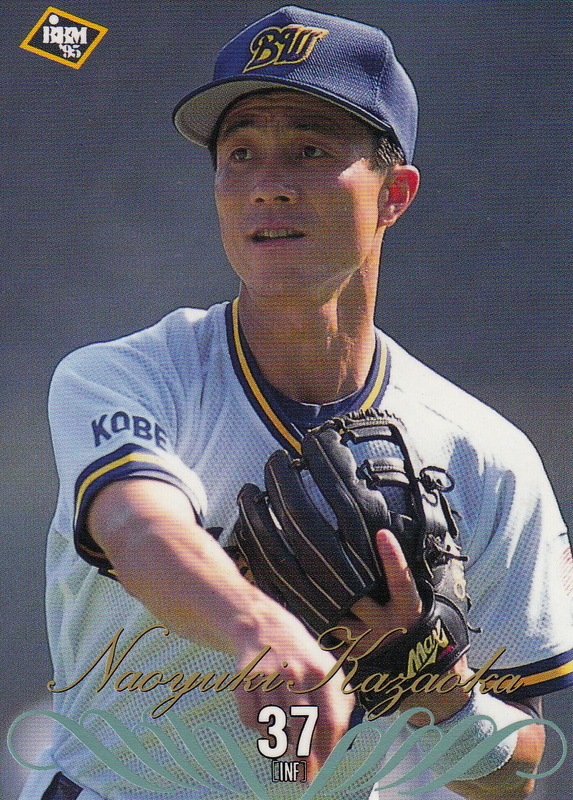 This set included a 19 card subset for the baseball team which included current NPB stars like Daisuke Matsuzaka, So Taguchi, Yukio Tanaka, Norihiro Nakamura and Nobuhiko Matsunaka as well as some corporate league players who would later star in NPB like Norihiro Akahoshi, Toshiya Sugiuchi and Shunsuke Watanabe (but unfortunately not Shinnosuke Abe). I've been working my way through this subset ever since I first discovered it existed thanks to a post by Ryan over five years ago. Actually in fairness - Ryan's been working my way through the subset for me and it's kind of cheating for me to include it here because he's actually found the last two cards I needed - I just don't have them in hand yet. Ryan found my cards while completing the entire 264 set for himself which is a pretty impressive feat. I love the cards that Yamakatsu issued in the late 1970's. 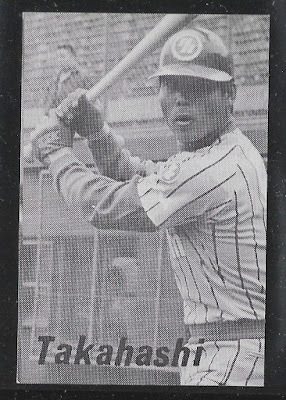 One of the more approachable sets was a set issued in 1978 that Engel labels the "JY6" set. 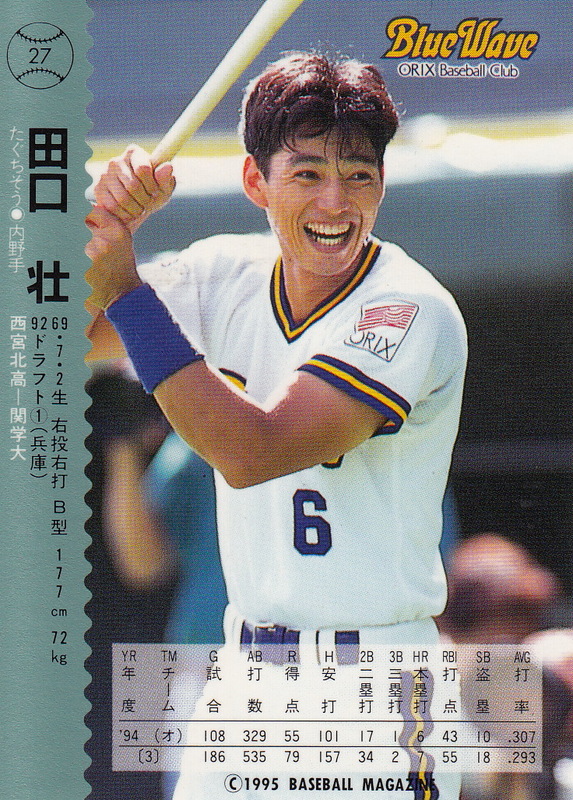 This set has 42 cards in it and is the only set Yamakatsu did that where the cards are close to the standard 2 1/2 by 3 1/2 inch size - all the others are either smaller or much larger. There's a good collection of stars in the set including Sachio Kinugasa, Koji Yamamoto, Hisashi Yamada, Yutaka Enatsu, Hiromitsu Kadota, Isao Harimoto and two cards of Sadaharu Oh. 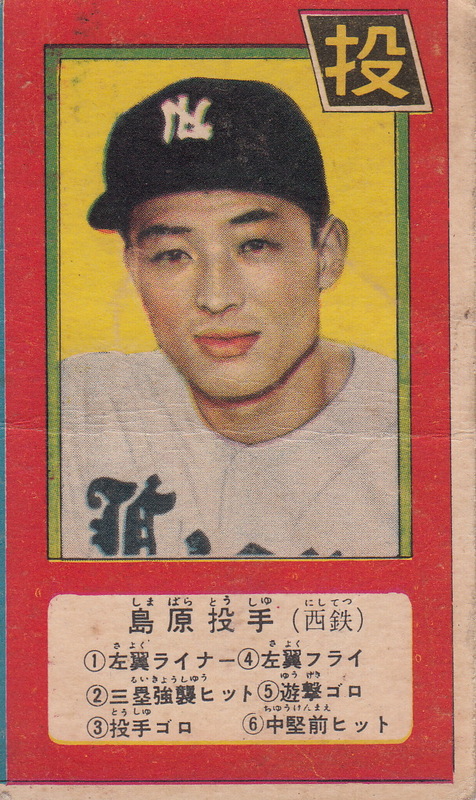 I'm down to only needing one card from the set - Koichi Tabuchi. I've seen it once on Yahoo! Japan Auctions but I (ok, Ryan) got outbid on it. But I'm optimistic it can be found. I was disappointed that Topps never really did a set for last year's World Baseball Classic so I decided that I would collect the Topps Now cards that they issued - despite the fact that they're much more expensive than I'd like. I did a pretty good job picking up the low hanging fruit of cheap-ish cards off of both Ebay and COMC but I'm down to 12 cards that I've only been seeing at $15 apiece and above. It'll get done eventually but it'll take some time. Back in 2009 Konami did an amazing set for the World Baseball Classic - a 253 card base set with two 12 card insert sets. One insert set was for the All Tournament team and the other was simple labeled "Special" cards. I had complete the base set a few years ago but I hadn't really planned on getting the inserts. But the guy I used to buy cards from (including this set) had given me the Darvish and Ichiro "special" cards when I met up with him in Tokyo and I found a couple others for not terrible prices on Ebay so I decided to give it a shot. I've got most of the "Special" cards (Ryan's got five of them waiting for me) but I still have most of the All Tournament team to get. 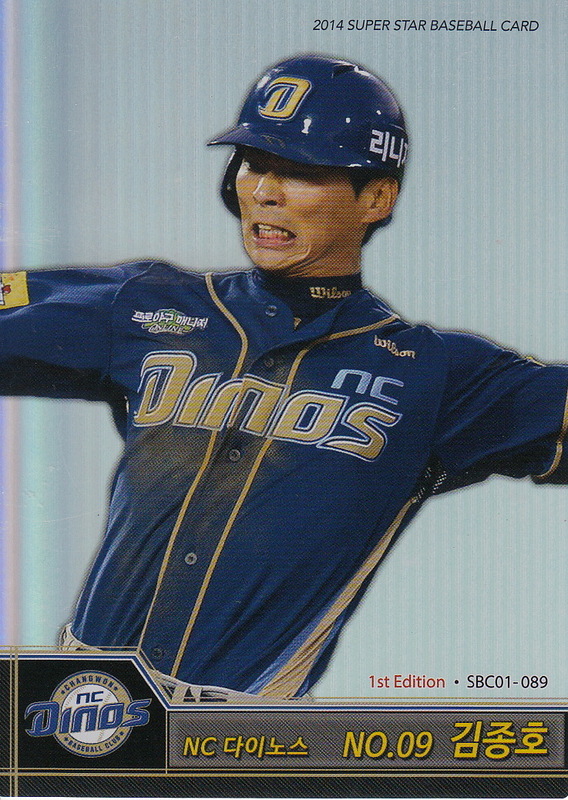 I have the complete Rookie Edition base sets from 2007 to the present but I'd like to finish off the first four editions. 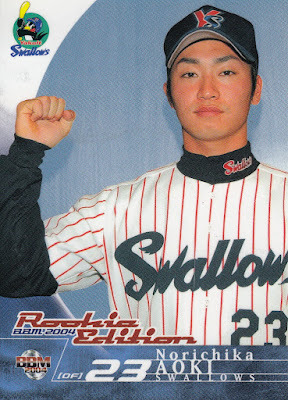 I've used the checklists for the sets on the Trading Card Database to determine how many I need and it's not really that many - 24 cards for 2003, 12 for 2004, 15 for 2005 and 17 for 2006. 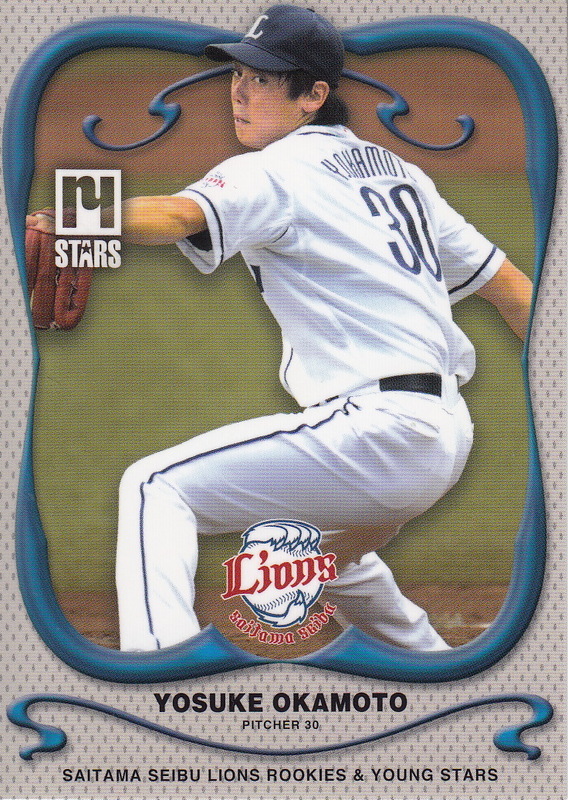 And I think I already have all the big names (Aoki from the 2004 set and Darvish from the 2005 set) - probably the biggest name I have left is Hideaki Wakui from the 2005 set. What I need to do is get the list online and added to my Want List. 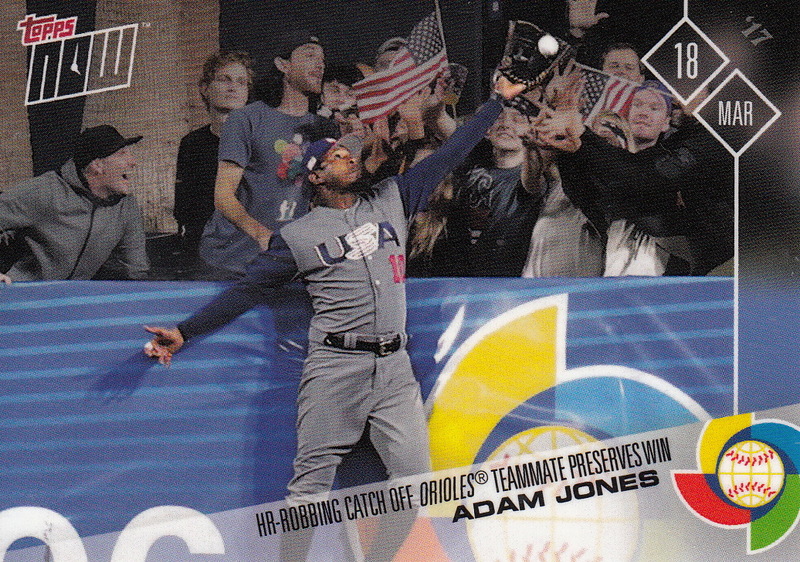 Last year Topps issued six "Throwback Thursday" cards on-line for the WBC. 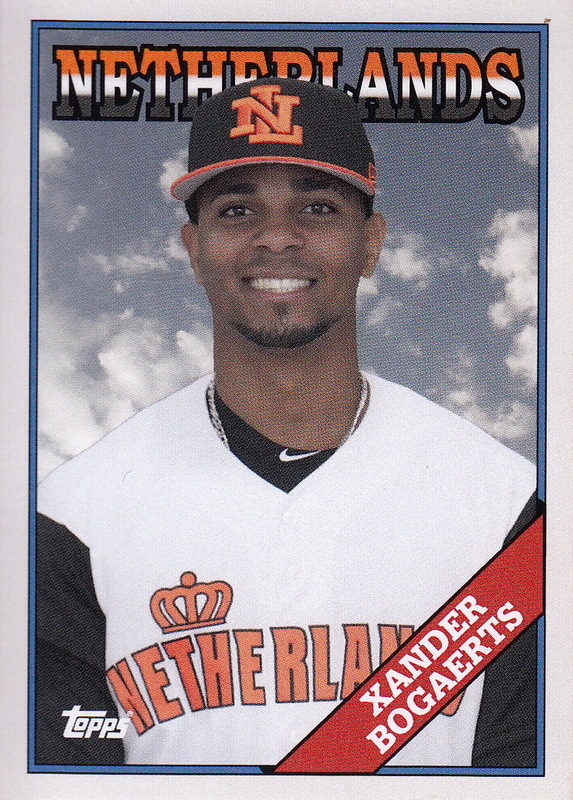 Each card featured a player from the tournament in their nation's uniform. The cards used the 1988 Topps baseball design. I had decided to try to get all of these around the time I decided to get all the Topps Now cards. Normally I probably wouldn't mention a project this small but I've been somewhat stymied after getting four cards. Of the remaining two cards one of them (Alex Bregman) I only see for at least $20 on Ebay and I have yet to see the other card (Carlos Correa) anywhere. So this one may take a while. I have the complete BBM "flagship" base sets from 1991 to 93 and from 2001 to the present. I'd like to attempt to complete the other seven sets but some of these would be easier than others. 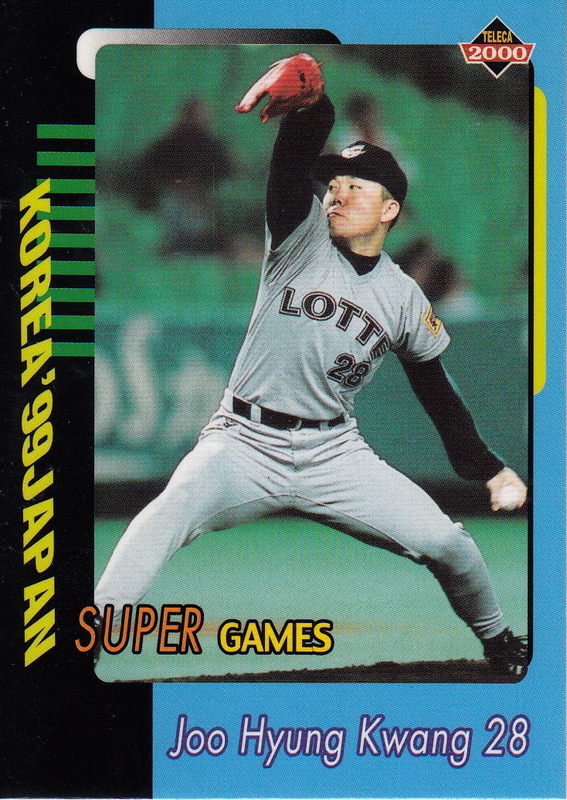 I'm reasonably close on a couple sets - 1994 (a recent pickup on Ebay has left me 45 cards away) and 1998 (roughly 50 although one of them is Yoshinobu Takahashi) - but I'm a bit further away on the others. I need anywhere from 120 to 300 cards for the other five sets. Everything other than the 1995 set is probably do-able - I need the puzzle cards and the Late Series card of Kevin Mitchell from 1995 which pushes the cost up quite a bit. I haven't quite put together checklists for all the sets yet so I'm not organized enough on these yet to really make an effort on them. 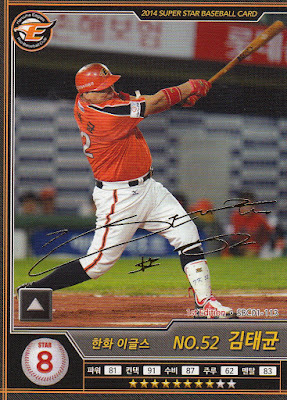 Teleca issued three KBO sets in 1999 and 2000. I had opened boxes for two of these sets - the 1999 regular set and the 1999 Premium set. Through help from Dan, George and Justin, I'm down to just needing one card from the regular set and four cards from the Premium set. These aren't cards that I'm likely to come by on Ebay or anywhere else so I'll probably need to continue to rely on the Three Amigos of KBO Cards to ever complete these sets. 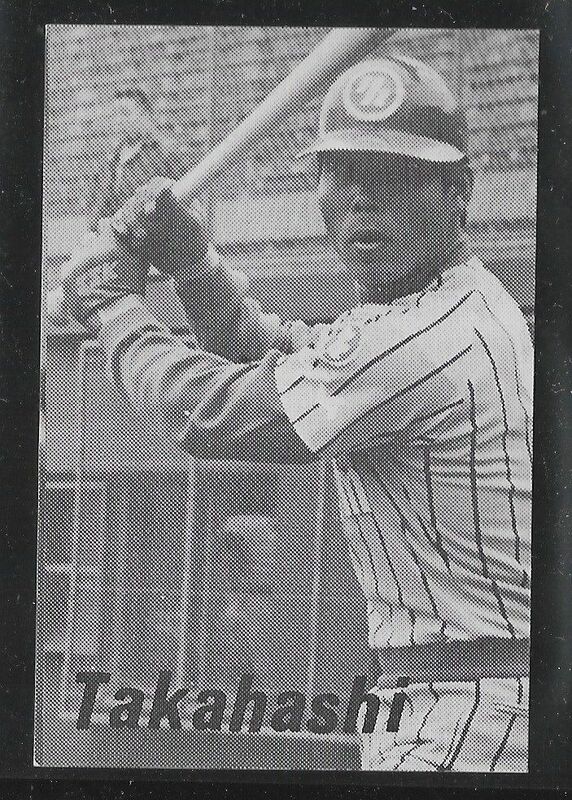 I'd love to get the 2000 Teleca base set as well but I only have about 14 cards from it so that's just not going to happen. The 2000 set also has a 46 card insert set for the 1999 Korea-Japan Super Games which features some Japanese players as well as Korean ones. Thanks to Dan, George and Justin I now have 15 of these cards. Again the only way I'm going to complete the set is to rely on the kindness of the three of them. The panel on the bottom of the card lists the outcomes of dice rolls. 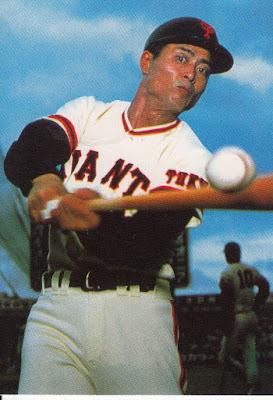 A while back I did a post on the six NPB sets that Ed Broder did in the mid 1970's. Jason had asked a question in a comment about a couple players who were not completely identified in Engel's checklists for the sets. Both the JA5 and JA6 sets list a player named "Takahashi". Unfortunately it's not clear which of about five or six players with that family name active at the time the cards are for. 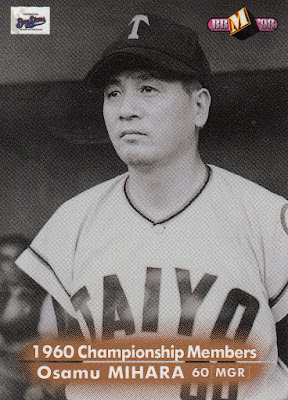 Engel does not indicate which team "Takahashi" was playing for. 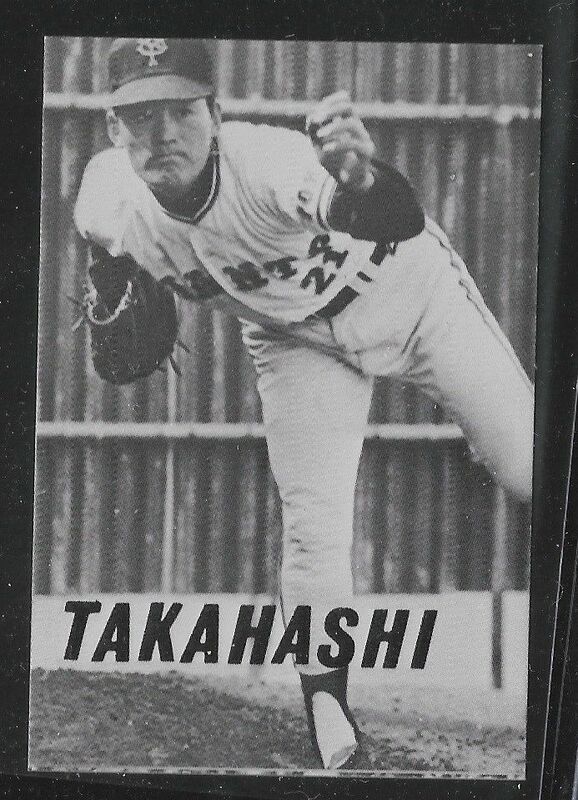 Luckily there was someone selling the cards on Ebay recently and I was able to see the cards and figure out who "Takahashi" was. 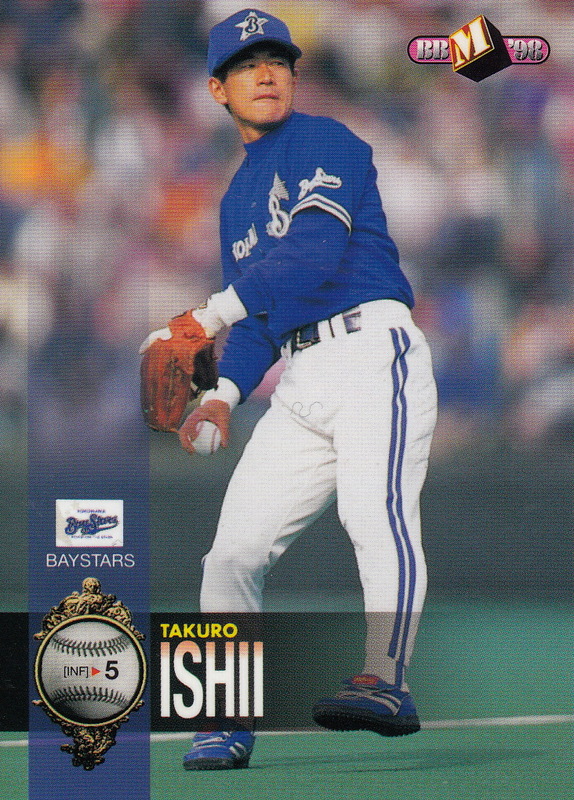 The JA5 Takahashi is Kazumi Takahashi of the Giants. 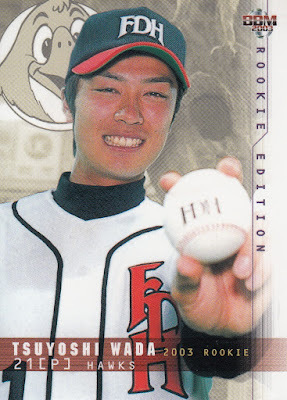 This is a pretty easy id as Kazumi wore #21 and we can see the number on his uniform. The JA6 Takahashi is a little harder. There were three Takahashi's with the Fighters that season - Hiroshi, Naoki and Kazumi (who had been traded to Nippon Ham by the Giants for Isao Harimoto in the 1975-76 off-season). However Naoki and Kazumi were pitchers so I'm pretty confident that this Takahashi is Hiroshi (who was one of the two other players that Nankai sent to the US in 1964 to play in the San Francisco organization along with Masanori Murakami). I want to point out that I didn't buy either of these cards so I need to thank the Ebay seller (who of course I didn't take note of) for posting the images. Ryan did a post a few months back talking about the 1991 BBM team logo holograms and I thought it might be good to do a post on the holograms that BBM did in their first four years doing cards - 1991 to 1994. 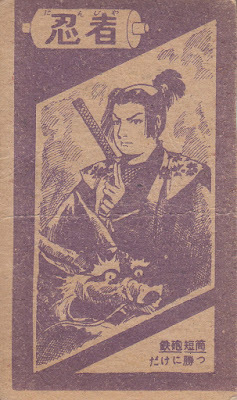 BBM was not the first card manufacturer to do holograms. 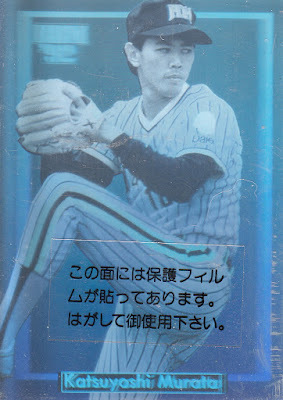 Calbee did a six card hologram set in 1989 that's extremely rare. 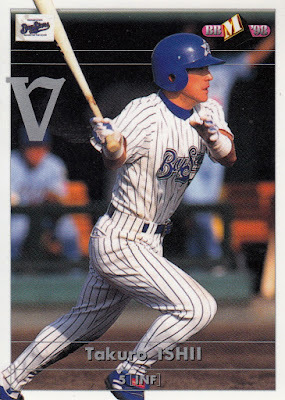 Like Ryan mentioned, the 1991 BBM set included team logo holograms. These were the only insert cards and were quite rare - according to Engel they were distributed at a rate of one every two boxes. Each box had 30 packs containing 10 cards each so that's 1 logo per 60 packs. All 12 cards were assigned number 240 - the base cards were numbered 1-239 and 241-399. 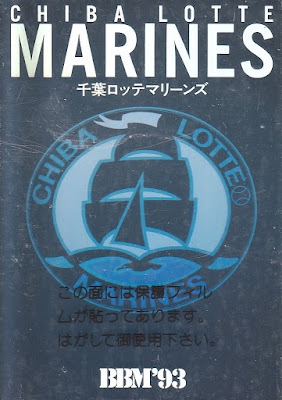 The latest Sports Card Magazine (SCM) that had a price guide for BBM cards (SCM #116) has a value of 2000 yen for each card. 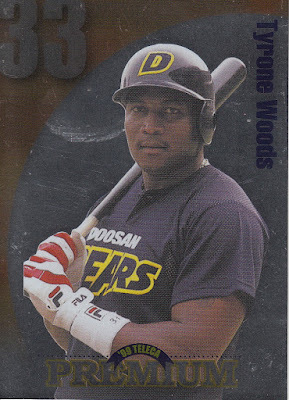 The 1992 BBM set featured player holograms. There were 12 in total - one for each team (as you probably guessed). 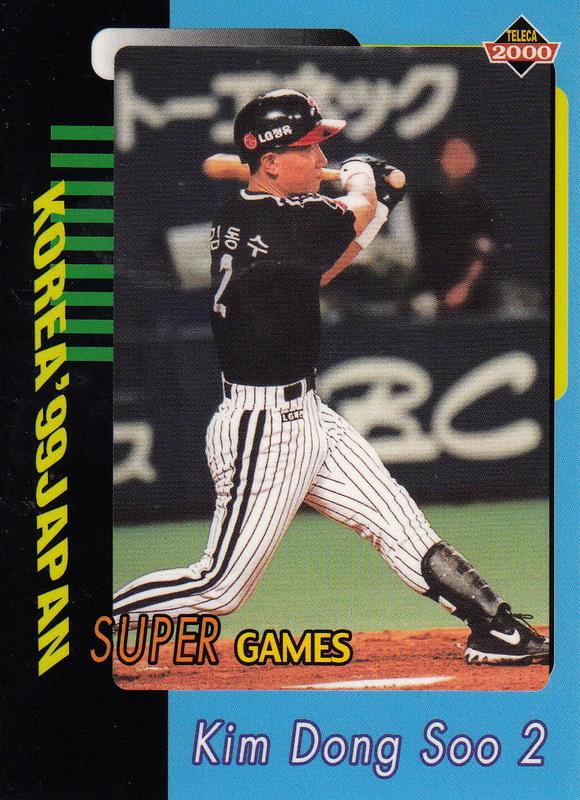 BBM issued the 1992 set in two separate series of 259 cards and there were six holograms inserted into cards of each series. Series One had holograms of Takahiro Ikeyama, Masumi Kuwata, Hideo Nomo, R. J. Reynolds, Kazuhiro Satoh and Hiroshi Yagi while Series Two had Koji Akiyama, Mitsuchika Hirai, Katsuyoshi Murata, Yukihiro Nishizaki, Hiromitsu Ochiai and Shinji Sasaoka. The cards are all unnumbered but officially the Series One holograms are all card number 250 and the Series Two holograms are all card number 500. 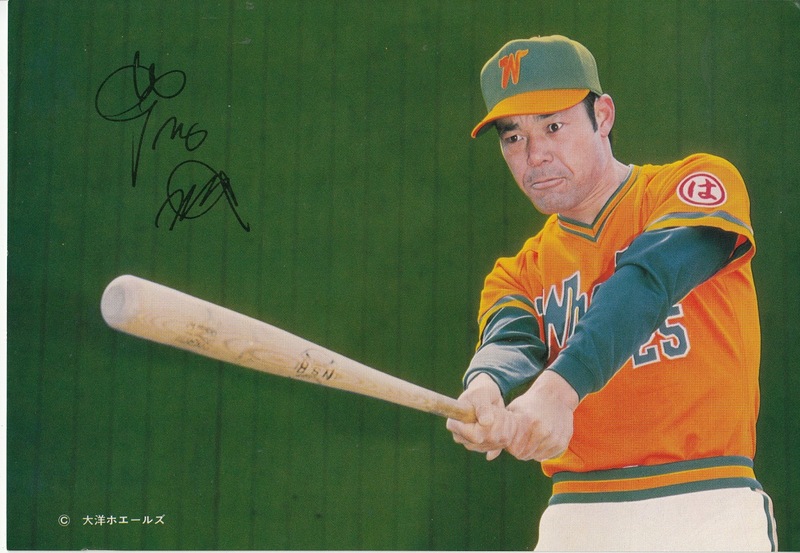 SCM has values for the cards starting at 1500 yen and going up to 3000 yen for Nomo, Akiyama and Ochiai. 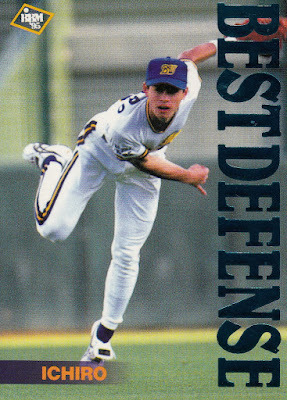 For 1993 BBM returned to the team logo holograms. This time they were not only inserted randomly in packs but all 12 were included in the factory set (the last time BBM issued a factory set for their flagship set). Despite the fact that the set was not issued in two series this time there were still two numbers were set aside in the checklist for the holograms - numbers 237 and 500. Again the holograms are unnumbered but according to SCM the six Pacific League team logos are assigned to #237 while the six Central League logos are #500. SCM has the value of each card at 500 yen. 1994 saw BBM go back to doing player holograms. This time there was a bit of twist on them - they had the player's home stadium in the background. Oddly enough the stadium photo was oriented horizontally while the player's photo was oriented vertically. Once again the holograms were unnumbered but this time there was no number or numbers put aside in the checklist to account for them. The 12 players (one from each team of course) were Akira Etoh, Atsuya Furuta, Mel Hall, Shinji Imanaka, Kazuhiro Kiyohara, Hideki Matsui, Koji Nodo, Hideo Nomo, Hiroki Nomura, Tsuyoshi Shinjyo, Matt Winters and Koichiro Yoshinaga. 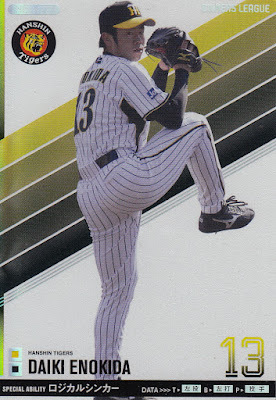 SCM has values starting at 2000 yen for these cards and going to 9000 yen for Matsui and Nomo. I will point out that the cards look better in person than they do in the scans. You'll notice that there's text on the front of each card. 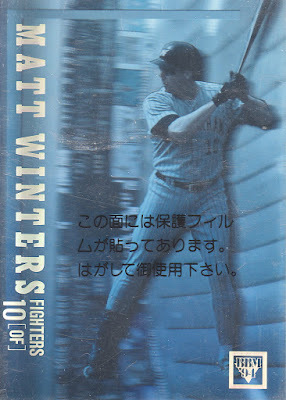 I'm not sure what this says but it's on a small decal for the 1991 and 1992 cards. For the 1993 and 1994 cards I think the text is on a clear "shield" covering the entire card. 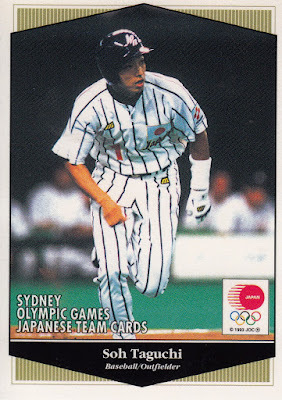 As far as I know BBM did not do any more hologram cards after 1994. Just a quick FYI - Prestige Collectibles' latest auction (#53) went live today and will be accepting bids until the 29th. There's a lot of very cool vintage stuff available - it's not cheap but if nothing else the auction is a great place to see some pretty rare stuff. Information on how to register and bid is on the website. All the cards are blank backed and unnumbered. I don't know for sure that the Matsubara card is from this set - it is not in Engel's listing for the set. 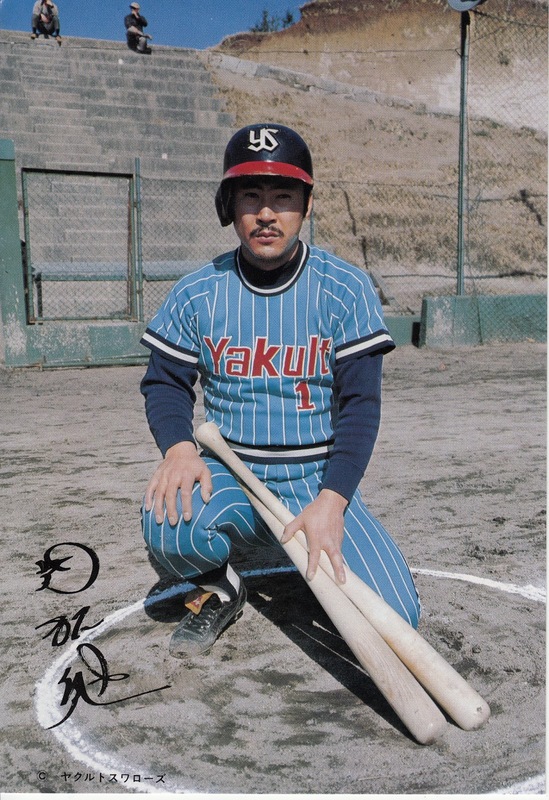 It could be from one of the other 1976 blank backed sets (JY1 or JY1c) but it's not listed there either - there's another Matsubara card listed with JY1. As Engel points out, these sets are very confusing. Engel lists the Oda card simply as "Fighters vs Buffaloes - action shot". I wouldn't have known it was Oda if the seller hadn't included the name in the listing. The Buffaloes pitcher is Toshio Kanbe. You can tell the card is for Oda because the copyright line at the bottom says "Nippon-Ham Fighters"
After 9 seasons in the majors pitcher Koji Uehara is heading back to NPB. He's returning to the Yomiuri Giants, the team he left following the 2008 season and the team that had drafted him out of the Osaka University of Physical Education in the first round of the draft twenty years ago this fall. 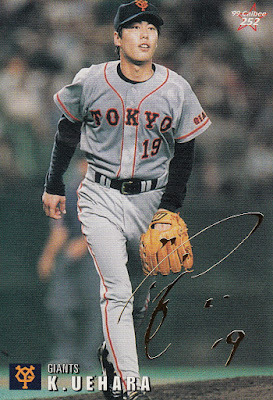 He'll be assigned uniform number 11 as his old number 19 is in use by Tomoyuki Sugano. 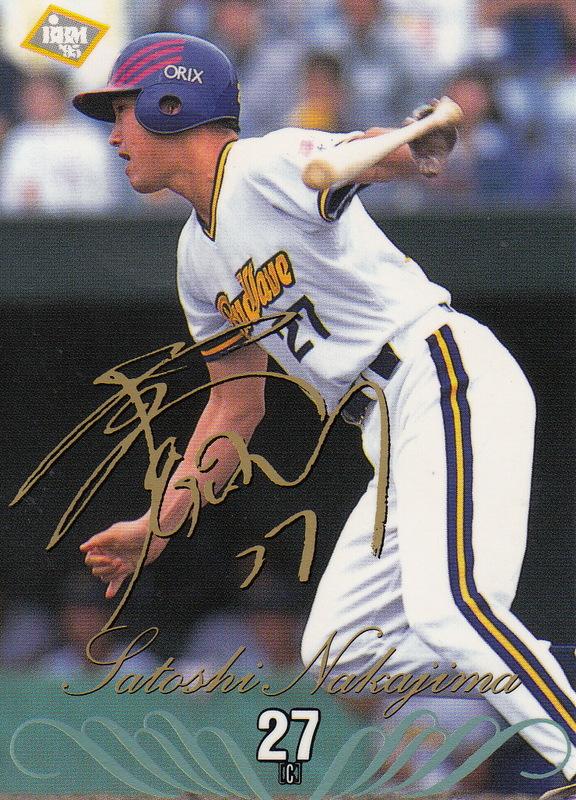 Calbee issued complete gold signature parallel versions of their cards in 1999 and 2000. I believe that hese sets were available as a mail-in redemption of one or more "lucky" cards randomly inserted into packs. 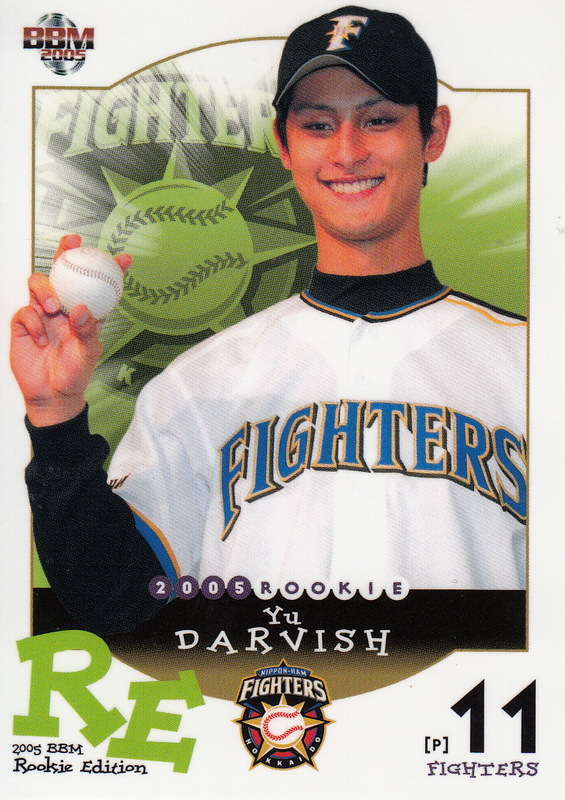 I got a near complete 1999 Series Four parallel that included this card at a store in Tokyo when I was there five years ago this week. 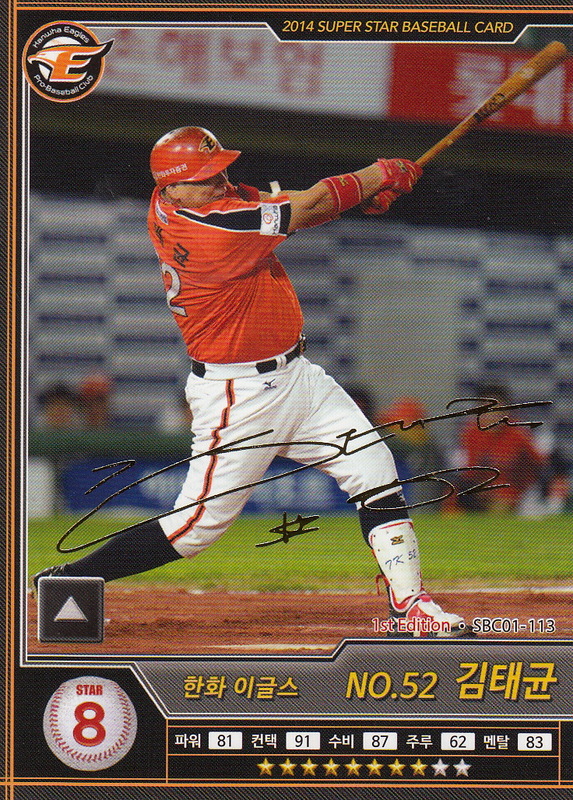 Got a package from Dan last week - he tracked down a bunch of KBO cards that I was looking for. We didn't trade this time - I just paid him for the cards. He was going to use what I paid him to pay Ryan for some stuff so ultimately my money was going to end up in Ryan's hands like so much of the rest of my hobby dollars! Anyway I wanted to do a quick recap on what Dan sent me. 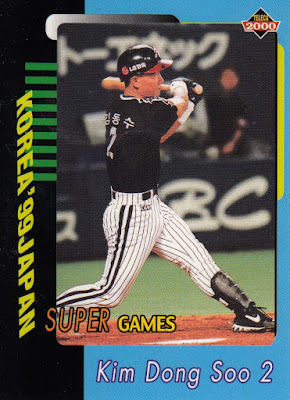 First up I got two more cards from the 2000 Teleca Korea-Japan Super Games insert set. I still need 30+ cards from this set so it's probably a pipe dream that I'm ever going to finish it but progress is progress. 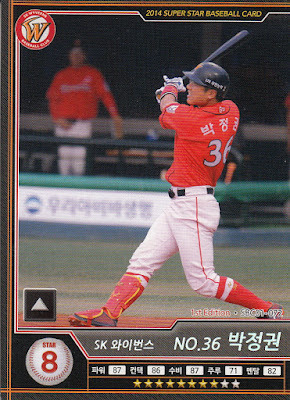 My "modern" (post 2014) KBO want list is now down to just that one 2014 Season One short print (#SBC01-001 Sok-Min Park) thanks to Dan's efforts. So thanks Dan! 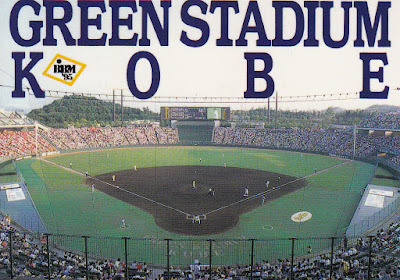 In 1995 the Orix Blue Wave won the Pacific League Pennant for the first time since the franchise had been purchased from Hankyu after the 1988 season and relocated to Kobe in 1991. It was the first pennant for the franchise since 1984. In January of 1995 the Kansei region had been rocked by the Great Hanshin Earthquake which had its epicenter near Kobe. The success of the Blue Wave that season helped rally the people of Kobe during their recovery. Late in the season BBM issued a 40 card box set for the team. This would be the first time that the company would issue a box set for a pennant winner. 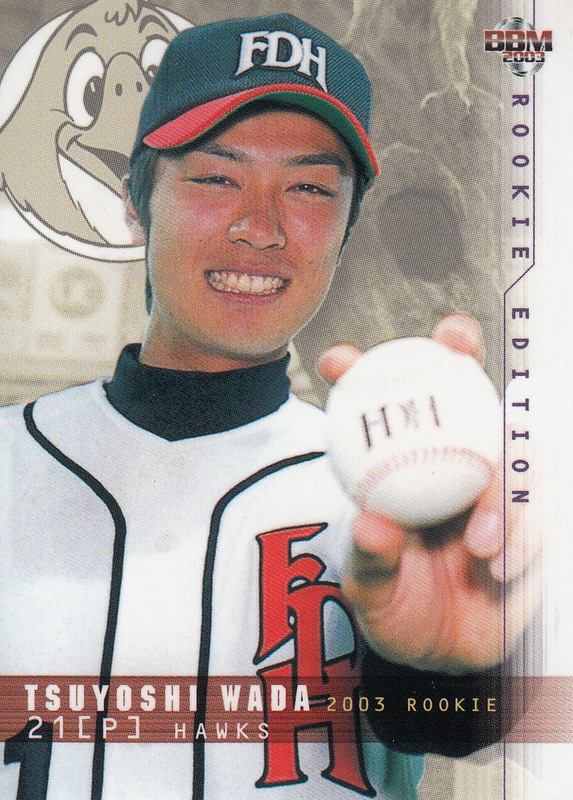 At this point in time BBM had only done one or two team box sets - both for the Hanshin Tigers (one in 1994 and the other in 1995 although I don't know if it was issued before the Orix set). I believe although I don't know for certain that BBM issued the set before the end of the regular season. 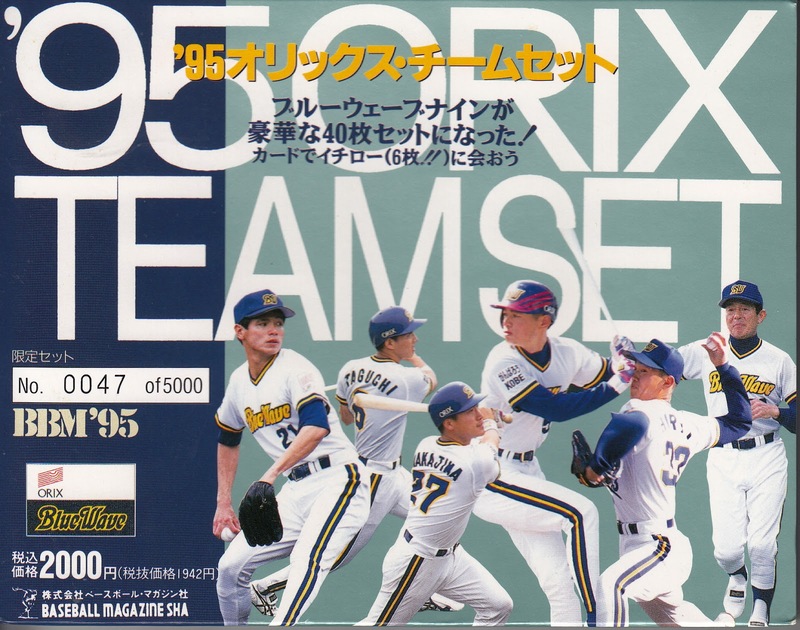 Orix ended up winning the pennant by 12 games over second place Lotte so it was probably pretty apparent by say August or September that they were going to win the pennant. As I mentioned, the set contained 40 cards. All 40 cards were base set cards - there were no inserts, parallels, autographs or memorabilia cards. 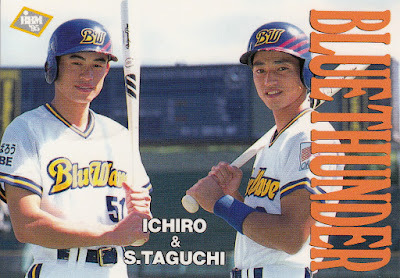 The first 30 cards in the set were the "regular" player cards and include Ichiro, So Taguchi, Shigetoshi Hasegawa, Satoshi Nakajima, Akinobu Okada, Nobuyuki Hoshino, Masumi Hirai, Koji Noda, Troy Neel and Doug Jennings along with manager Akira Ohgi. 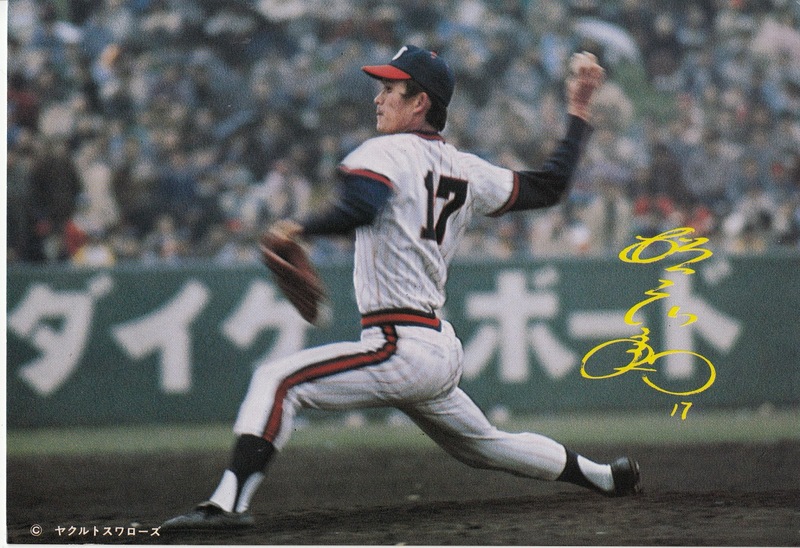 10 of these cards had gold facsimile autographs on the front (Yasuo Fujii, Hagegawa, Hoshino, Nakajima, Noda, Hirofumi Ogawa, Yoshinori Satoh, Ichiro, Taguchi and Satoshi Takahashi. The remaining 10 cards in the set were broken into several subsets. Cards 31 & 32 feature multiple players. Card #31 has Ichiro and Taguchi on it and is called "Blue Thunder". Card #32 is called "Blue Wave Fireman" and has Masafumi Hirai and Takahito Nomura on it. Cards 33-37 feature the "Best" players on the team. 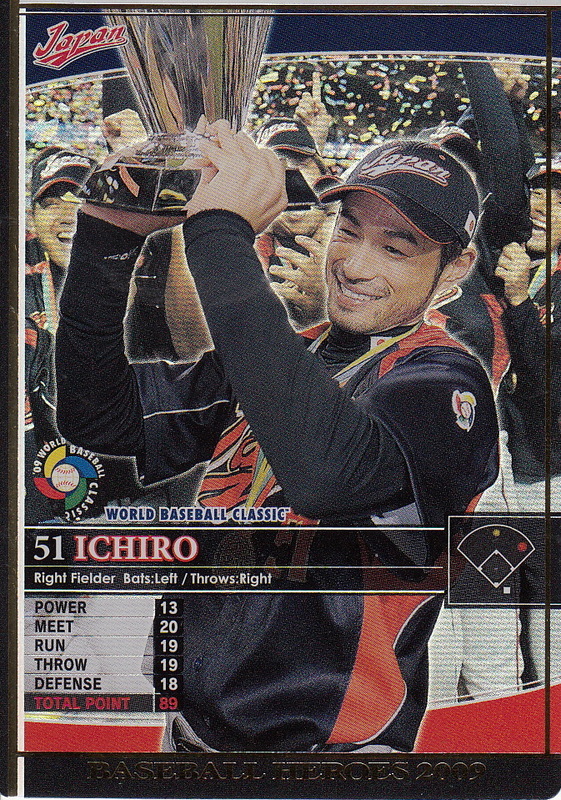 Ichiro has three of these cards "Best Hitter", "Best Baserunner" and "Best Defense". 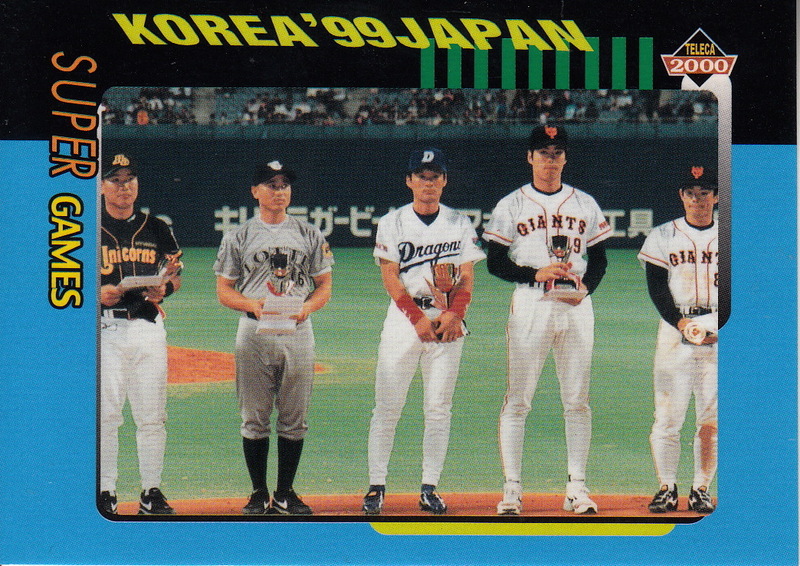 The other two are Koji Noda ("Best Starter") and Masafumi Hirai ("Best Reliever"). The last three cards in the set are for the mascot Neppie (#38), Orix's home park of Green Stadium Kobe (#39) and the "Electric" (kira) card of Ichiro that's labelled "The Natural" (#40). If you've been counting along at home you'll have come to the realization that there are six Ichiro cards in the set. 5000 of these sets were made. 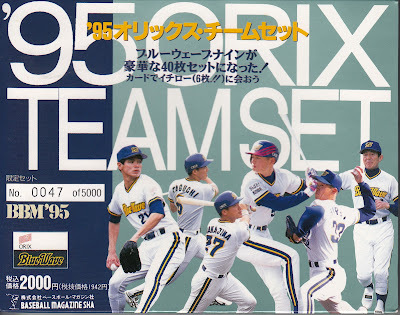 Apparently these sets were so popular with Orix fans that BBM ended up issuing a second 40 card box set for the team. 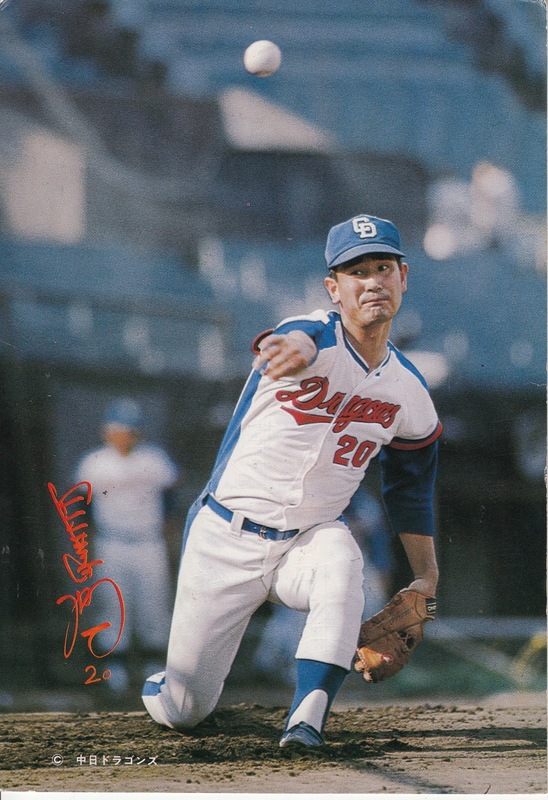 I don't know for certain but I think that the first 30 cards in the second set (known as "Orix Team Set II") are identical to the corresponding cards in the first set except that the players' names are in red instead of gold (don't know about the facsimile signatures). I think (although again I don't know for sure) that cards 31-38 of the later set featured the "Team Leaders" in a number of categories. 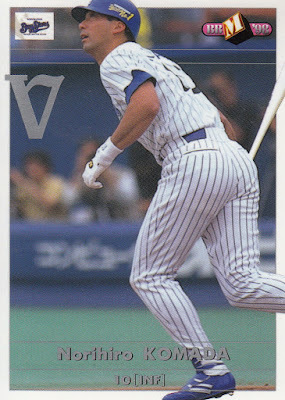 Card #39 was for the "Moment Of Victory" when the Blue Wave actually clinched the pennant and card #40 was another Ichiro card labelled "The Natural" (although featuring a different photo and no kira finish). 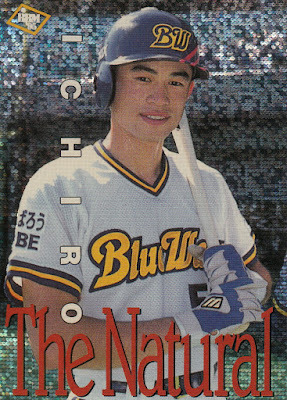 The second set has five total Ichiro cards. 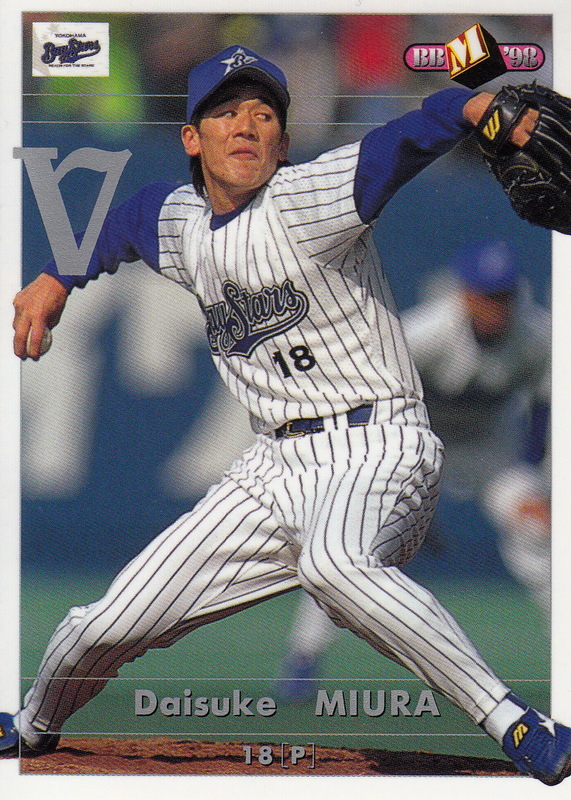 Orix ultimately lost the Nippon Series that season to the Yakult Swallows but bounced back in 1996 to defeat the Yomiuri Giants for the franchises most recent Nippon Series Championship. Lightening struck again for BBM in 1998. The Yokohama Baystars won the Central League pennant for the first time since 1960 when they were the Taiyo Whales and played in Kawasaki. BBM again issued a 40 card box set (called "Get The Flag!") 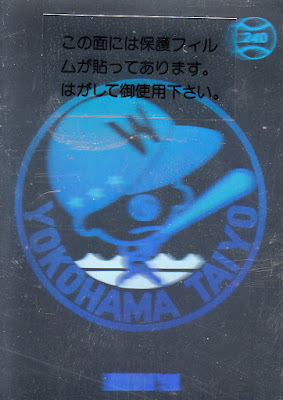 and again I think it was published before the end of the regular season (although the race was much closer than the 1995 PL race - the Baystars ended the season only four games ahead of the second place Chunichi Dragons). As in 1995 the run of 5000 box sets sold out quickly and BBM ended up issuing a second set - this time the print run was 10,000. In this case I have the second set instead of the first so I'll describe it first and then talk about the differences between it and the first set. I will mention that the first set is numbered YB1 to YB40 while the second set is numbered YB41 to YB80 - this is not how the Orix sets were done. Both of those sets were numbered 1-40. Like the Orix sets, the 40 cards in these sets contained only base cards - no inserts, parallels, autographed or memorabilia cards. 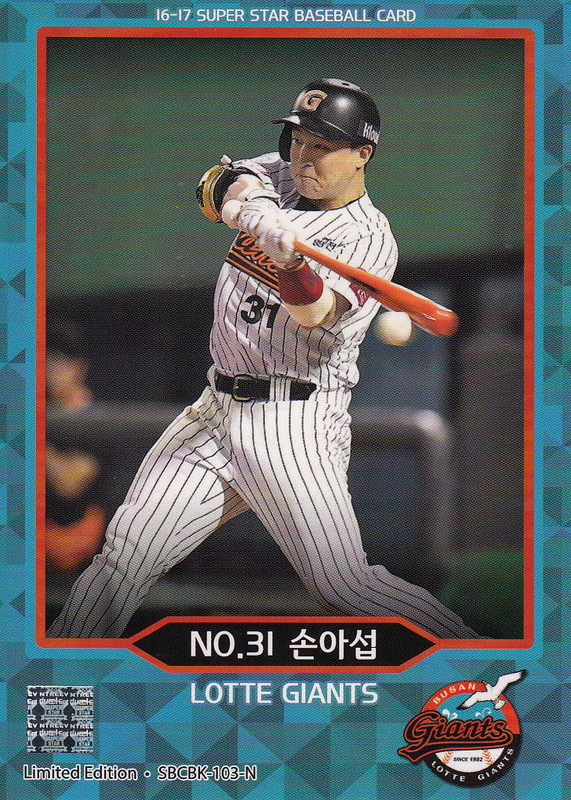 The first 31 cards in the set are cards for manager Hiroshi Gondoh and various Baystars players including Kazuhiro Sasaki, Daisuke Miura, Tajuro Ishii, Motonobu Tanishige, Norihiro Komada, Bobby Rose, Takanori Suzuki and Takashi Saitoh. 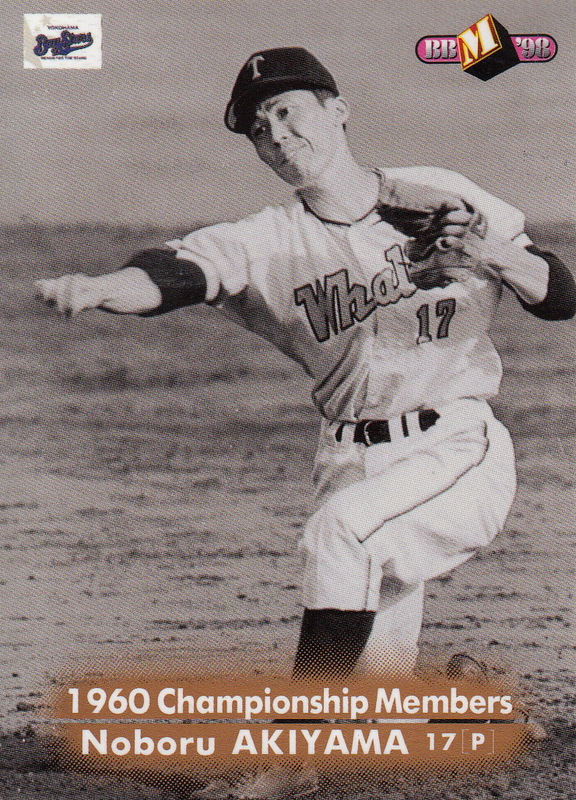 The next six cards in the set contain members of the 1960 Taiyo Whales - manager Osamu Mihara and players Noburo Akiyama, Kiyoshi Doi, Akihito Kondoh, Kazuhiko Kondoh and Takeshi Kuwata. All the cards are black and white with a bit of a sepia tinge. 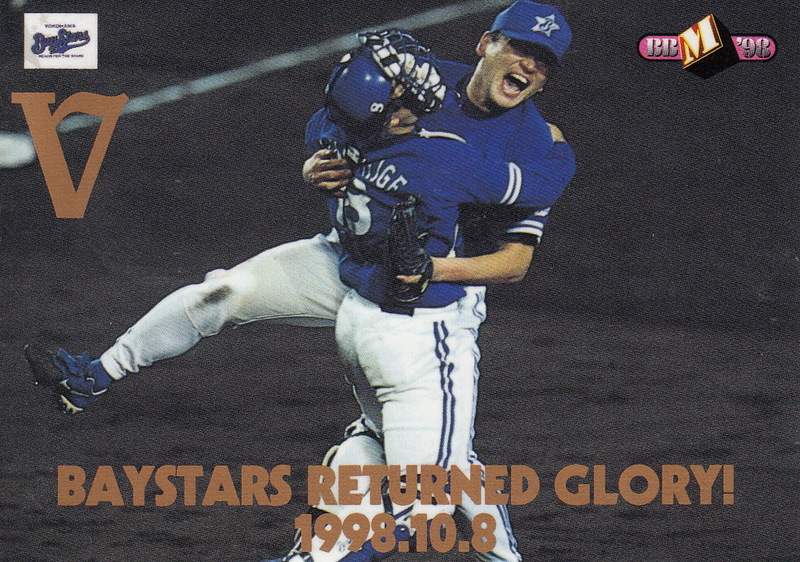 The final three cards in the set are entitled "Baystars Returned Glory!" 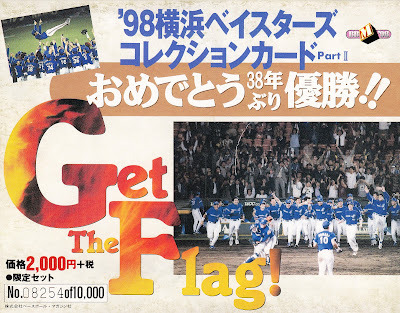 and feature scenes from the Baystars' pennant clinching victory on October 8, 1998. 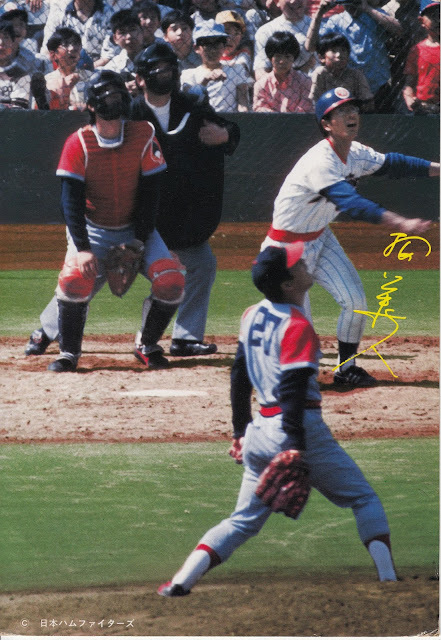 There's one card showing the traditional doage for Gondoh, a card showing Tanishige and I think Sasaki embracing after the last out and a card showing the players saluting their fans. The first set also featured 31 player cards. As far as I can tell, the cards look almost exactly the same except that the original cards featured full bleed photos while the cards in the second set were white bordered. The names on the cards in the first set are in gold while they are in silver in the second set. The player cards in the second set also feature a silver "V" that is not on the ones in the first set. The final nine cards in the first set are completely different than the final nine cards in the second set. 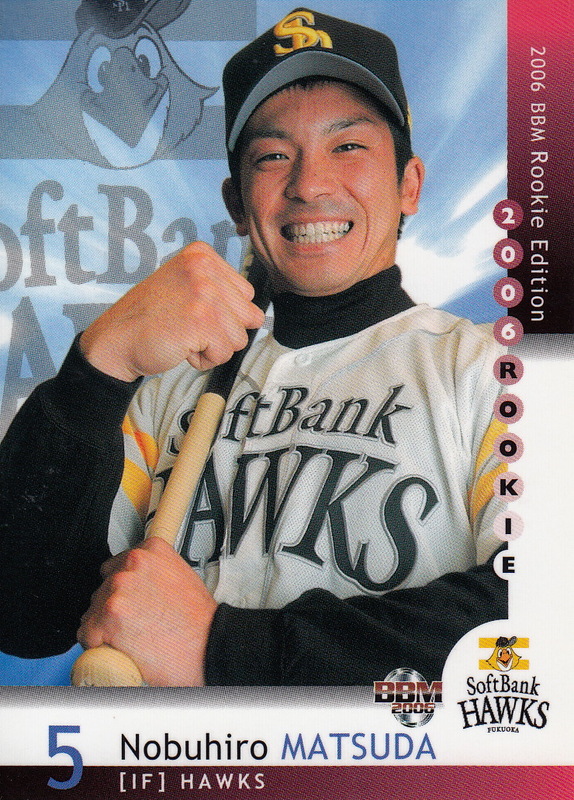 There's three multi-player cards but only the first one of these feature players on the 1998 team - Sasaki, Rose and Suzuki. 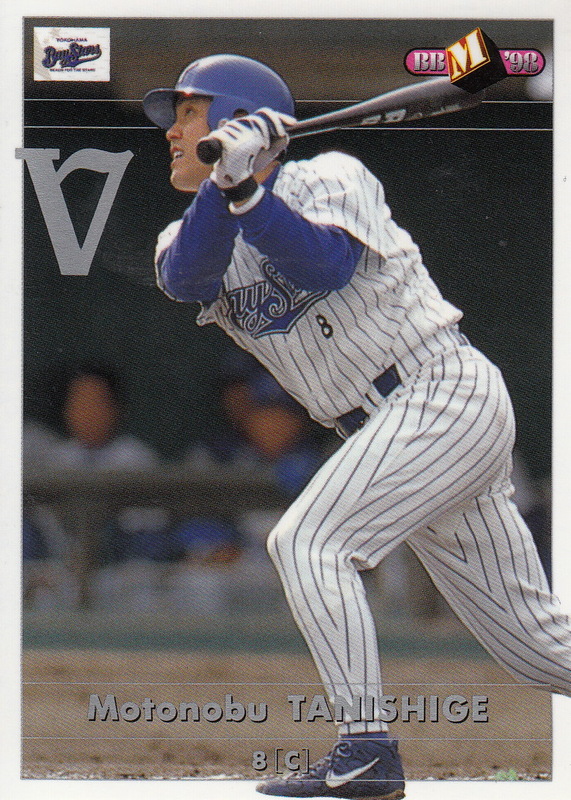 The other two cards have former Yokohama players - one has Akio Saitoh and Kazuhiko Endoh while the other features Daisuke Yamashita and Tomio Tashiro. The next three cards feature "Memorable Moments" from 1998 and the final three cards all feature Sasaki. 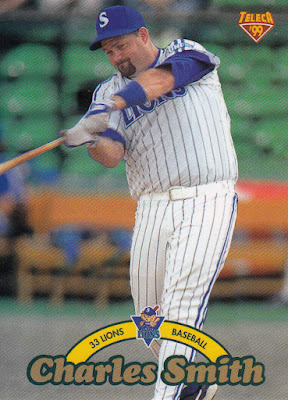 The Baystars went on to defeat the Lions in the Nippon Series that year. It was the last time that they made the Series until last fall. As always, Gary Engel's "Japanese Baseball Card and Price Guide - 7th Edition" was invaluable in researching this topic.